Got an H1R or H2R that needs glass? Well look no further we've got what you need. We've got the actual stuff used by Team Hansen, yep given to us by Bob Hansen. We offer the '73-'74 Green Meanie factory H2R road race fairing. This two piece fairing is an upper with a belly pan. This is the wide Hansen-style seat that is wider, taller and longer than the original skinny seat, to fit the Hansen H2R frames. It is also wide enough to be squeezed onto a stock H1 / H2 frame. 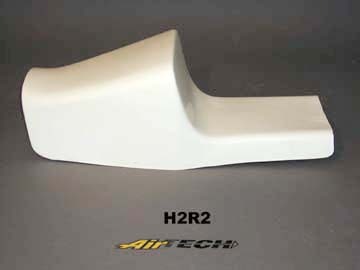 This is the narrow, skinny style seat that was available for the factory racing H2R chassis. 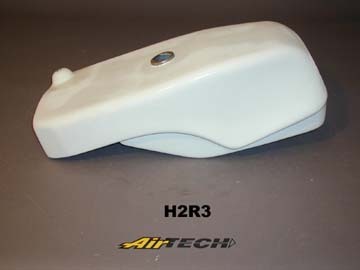 Fuel tank for the 73 H2R. It will only fit the H2R race chassis, not a stock H1/H2 chassis. 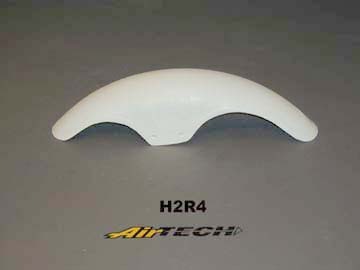 This is the race fender off an H1R. This fender has an 18" radius. 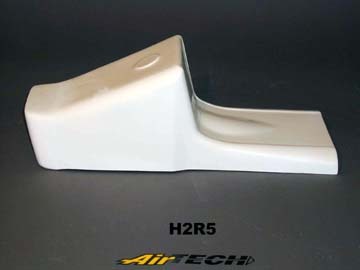 H2R race fender. 18" radius. This is the rare early inner rear fender for the H1R that bolts to the chassis to keep crud from being thrown off the tires into the carbs. This is the rare inner rear fender for the H2R that bolts to the chassis to keep crud from being thrown off the tires into the carbs.